How can we visualise the range of laptimes across a race, and as a result identify when a driver is laying down a set of particularly good times? 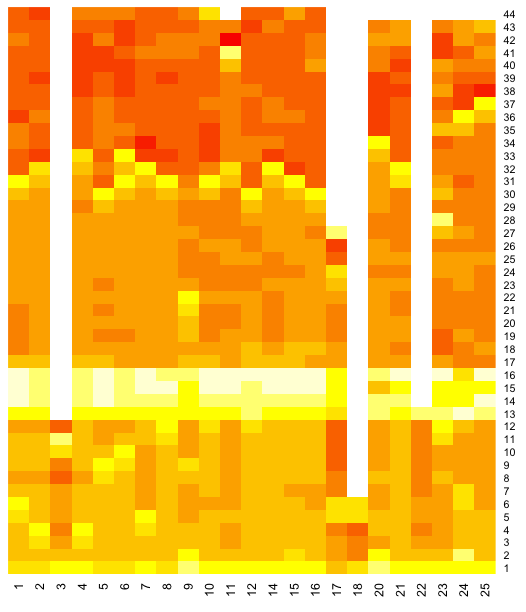 Here's a first foray into using heat maps to visualise times over a race. Here's the R script I used to generate the heatmap. It pulls the data from the Google spreadsheet I set up to store timing data from the race. This looks more textured to me...if the fuel penalty model is sound, then maybe it shows some deterioration in times due to tyre wear.....? If you can find better ways of doing the colour mapping, or scaling the data, please let me know in the comments. I also wonder whether a heat map showing position held by each car at the end of each lap in the race would be informative? PS if you want to try out R, I suggest using RStudio. We've sometimes use a similar technique to get a better idea of lap times. Here is an old example I did using Excel and its "conditional formatting". A pretty nifty way of getting results quickly. The two major issues I have with my chart are the colour palette/colour range and the illusory optical effects. If I can suss out how to do heatmap layers, one thing I think I'd like to try is marking purple laps. The optical illusion effects present another challenge. Maybe there are colour mappings that can mitigate this effect? Do you have any examples of how the heat map has provided any insights, either during a race, or in post hoc analysis? This whole visualisation thing is a real voyage of discovery for me, so I'll keep on hunting! This is very nice. In light of your new chart, may I show you something I've done simply wit excel? @double eyepatch - that's interesting: an intra-cell bar chart. Have you posted the formula you used to create that effect anywhere? The timing data is also from the FIA timing press PDFs you obtain. However I don't use any scripts to import the data into excel, I just copy/paste each drivers lap times into columns and parse the table into different stages to get what I need to produce that table. There's plenty of manual stages in my methods and at this stage I'm trying to make a macro to make the whole thing easier, but my programmings lacking a bit. Have a play around with my Belgian GP data if you like. @double eyepatch My scripts are all automated; I post the data I scrape into spreadsheet form on Google spreadsheets (linked from http://f1datajunkie.blogspot.com/p/data.html ) - feel free to make use of it... and let me know if I can put it into any more useful form.